Your website is the first stop for answers when customers have problems. If they can find the right resolutions to their customer service issues, easily, over their channel of choice, it improves customer experiences. If they can’t, they defect. An effective customer self-service knowledge base (KB) portal, therefore, is critical to achieving higher satisfaction ratings, retention, and advocacy. When knowledge isn’t stored properly or easily accessible, it makes contact center agent-advisors inefficient and lose confidence. In some companies that eGain eventually worked with, agents used to switch between a dozen different windows and systems to find the right information to give during a customer interaction. Customer service provided in this manner is inconsistent, inaccurate, and only as good as the agent that’s delivering it. The eGain knowledge base or the eGain KB is a centralized repository of knowledge in your enterprise. The software supports the creation, maintenance, and distribution of multilingual and multichannel knowledge, and provides users — customers and contact center agents — easy and multimodal access to answers. The KB ensures that your business is delivering timely, consistent, accurate knowledge across channels and touchpoints. This in turn enables your customers to self-serve themselves on your website and dramatically reduce escalations into contact centers. Advisors feel empowered to handle any questions they receive from customers – as customers resolve easier issues through self-service, advisors are increasingly getting complex customer service queries – and are consequently more productive and happier. This also reduces onboarding times significantly, saving millions for the organization. The eGain KB is an integral part of eGain Knowledge+AI, eGain’s awarded knowledge management software. It lets you provide intranet or extranet access to the centralized knowledge base. 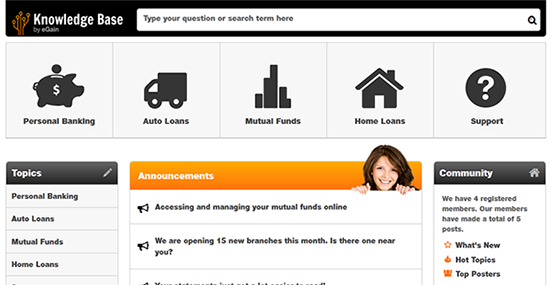 Agents, other employees and even partners can view FAQ, or browse through and search the knowledge base. You can define the criteria for displaying articles based on various article properties such as hot topics, most popular, newly added, recently changed, specific dynamic search criteria, announcements, etc. Dynamic FAQ lists consider the history of KB usage and presents the user with most articles sorted based on the ranking calculation within a topic or subtopic. The browse folders feature is another way of allowing end users to access the knowledge base. The browse hierarchical tree feature is one of several ways of allowing users to access the knowledge base. The tree can be expanded by clicking to reveal all the subtopics contained in the tree. Search for articles using the keywords contained in the article or meta fields. Search for articles using the phrases contained in the article or meta fields. Search for articles matching specific article properties like author, date, topic etc. The eGain knowledge base becomes “the enabler” for this bank’s customer service and contact center transformation. It enables the impossible, i.e., makes any agent any call a reality, and takes the bank to #1 NPS rating among peers in its market.